Last Friday, I attended a closed door session on FinTech at the White House – alongside a few others in the Financial services ecosystem – Founders, Investors, Academics, a handful of Financial institutions and Regulators. 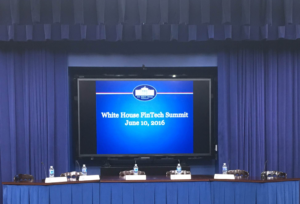 Titled “The White House FinTech Summit” – the intent was to promote a discussion, sans media, on what could be done better to progress innovation in financial services, as well as communicate the administration’s own perspective on topics such as Financial inclusion, Regulatory arbitrage, Cyber Security and Big Data. I am only writing down what resonated most, with me – so this isn’t meant to be a complete account of the half day event. On this topic of “what should we be doing more to encourage startups to come to US” I would have liked Stripe to chime in here, with what they are likely to have learned from launching Atlas – I call it “Company in a Box” – which is a suite of services including banking and payment processing to enable entrepreneurs to maintain a presence in the US and sell to the US consumer. “As banking moves from branch to app – from a wholly owned and curated experience inside a branch – TO – an app that vies for space in a “democratized” and crowded home screen, banks must realize that they no longer own the entire canvas. Instead they merely follow the design principles set by the most-used apps on our phones. I no longer compare my bank app with that of another bank, I compare it against the services I use often – Facebook, Twitter, Gmail, Apple Pay, Uber etc. And if who you compete with on this platform has been redrawn to include brands who have nothing to do with managing money – then you have to try as hard not to be boxed in as a bank. Representatives from a couple of agencies – were a bit more cautionary in their approach to the topic of FinTech, scaling distribution and the focus around Big data, with Urban affairs asking FinTech firms to be cognizant of algorithmic bias in their models – because the data that drives decisions could be slanted or skewed towards a particular demographic – and used civil rights as an example. Anjan Mukherjee of Treasury, focused on Cybersecurity – and Chris Carroll (from John Hopkins) warned of a potential “Asteroid impact” manifesting in a data breach involving one or more FinTech firms – which could cause an inexorable exodus of trust away from the upstarts towards the incumbents. I understand the sentiment, and we have had a couple of examples where a couple of the startups have invited criticism around data handling and security – and this topic invites further scrutiny in light of EU PSD2 as well as the banking incumbents clamping down on access to customer account data. There is much agreement that screen scraping and sharing customer credentials with personal finance apps and aggregators is inadvisable – but to not consider that these rather poor approaches emerged only in the absence of a genuine, bank approved framework or API, would be a missed opportunity to understand why these exist in the first place. We do need secure methods for consumers to transfer customer data to 3rd party platforms or aggregators to extract more value out of the interactions with their bank. And we need guidelines to make it easy and transparent – so that consumers can make an informed decision after having considered the apparent cost and benefits involved. I hope we will sort this out soon – between Banks, Startups, Consumer Advocates and Regulators – not just because a systems breach is inevitable that will sweep up millions of unsafely stored consumer banking credentials – but the opportunity to create standards, improve security and create a level playing field for all will be the only desirable outcome to discussions such as the one on last Friday. Much thanks to Adrienne Harris at the White House, for hosting this event and inviting us to join this debate. I think that this disruption will happen faster in emerging markets like India when compared to developed markets. – Banks have done a bad job in coverage & a worse job in the face to face branch experience. I think all innovators / disruption seekers should actively think of piloting in India.